Though there will be some rain this week, the hot and humid days are continuing in Tokyo. So in order to enjoy cooling sensation, I will show you some cool-looking bonsai pots today. Hope they make you feel like you are in the cool air or sea. Looking at this pot, I feel as though I’m on a glacier in the valley between high mountains like the Swiss Alps. I have never been there, so I just imagine. 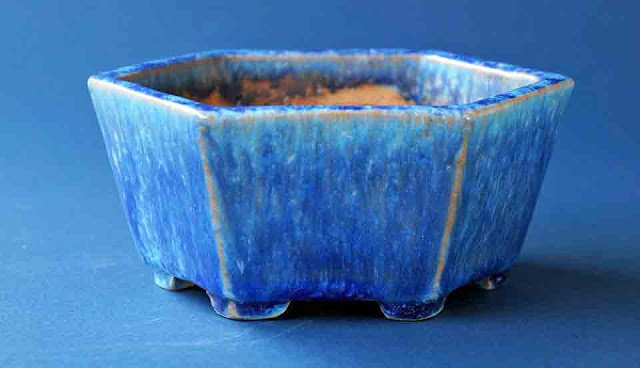 The deep blue glaze is covered over the light blue glaze on this pot. 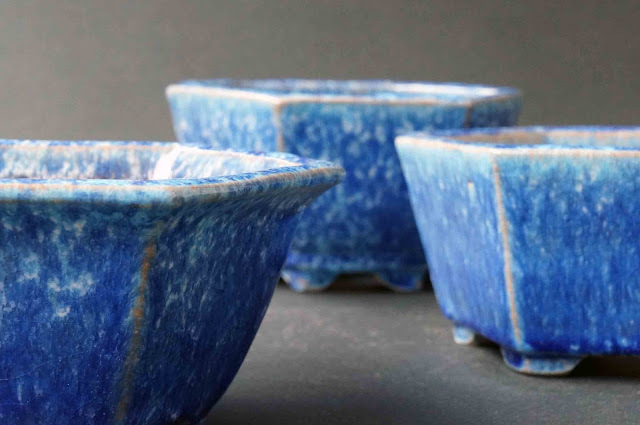 The flow of the deep blue glaze creates interesting patterns and the cool-looking gradations of blue color. This pot was made by the potter, Hideaki Shimizu/Eimei of Tokoname and is one of his representative works. Eimei is Mr. Shimizu’s professional name as a potter. He is one of the most famous bonsai potters in Japan and his works have had a significant influence on bonsai potters overseas. I think the characteristics of his works are the beauty of the form and the very delicate color of the glaze. 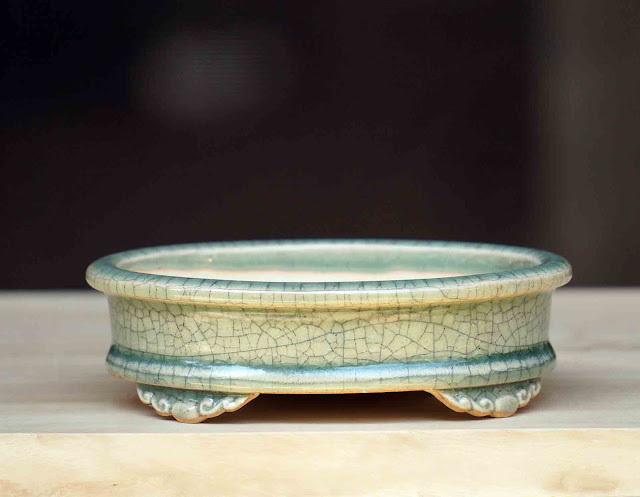 The Celadon glaze of this pot sometimes looks light yellow green and sometimes light blue. 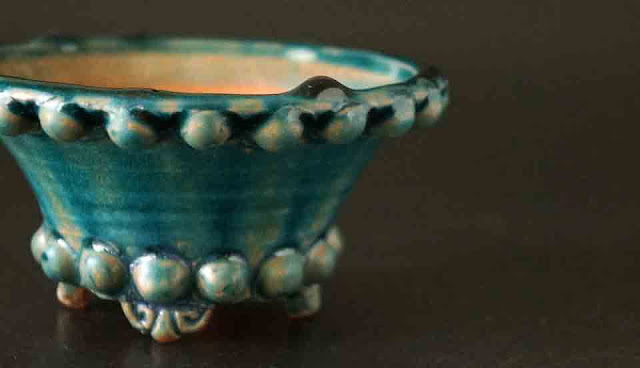 The small crazes covering the surface make the pot more attractive. They look like small crystals of ice and that’s why I like seeing it on hot days. You can see it more here. My customer living in the US, saw this pot and said that looks like something you would see underwater in the Caribean. That is very true! The glaze looks like the water keeps flowing on the surface of the pot. Some glaze drops on the brim of the pot giving a cool feeling. It is also available here. 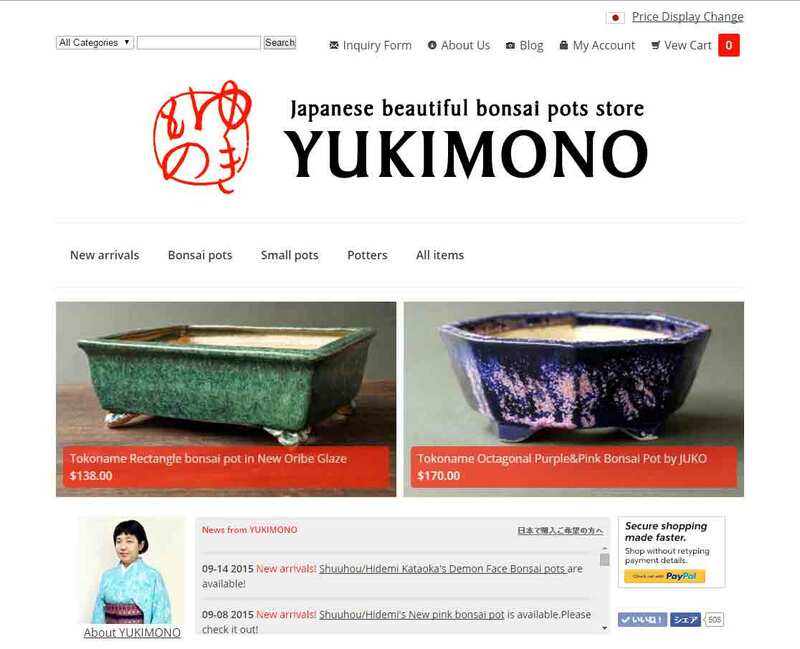 Please visit our online store YUKIMONO. Thank you!